Born 8 August 2017, the Gold Rush litter. 6 males and 1 females, grey/white and black/white puppys. Well sized puppys, birth weight between 455 and 623 grams. Mother is Back to work Long Distance Trotter (Ellen). Born 28/07/2014. SE48187/2014. 58 cm at shoulders, 29 kg. Health results: Hips B, Elbows O and eyes clear. PN free. Working results: Many mid distance tourist tours at Laplands Wolftrail. Finished 1 long distance race. 300 km at Gold Rush Run in 2017. Super trotter. Working trotting speed 6-14 km/hour. Non aggressive temperament. Wheel dog. Good drive, good worker. Father, Tiguaq’s Pok Nathey (Bill). Born 15/10/2014. SE38459/2016. 61 cm at shoulders, 28 kg. Health results: Hips: A, Elbows: 0, Eyes clear, PN: free by parents. Working results: Many mid distance tourist tours at Laplands Wolftrail. Finished 300 km at the Gold Rush Run 2017. Working trotting speed 10-18 km/hour. Non aggressive male, Leaddog/swingdog. High drive. Good feet. Good trotter. Good worker. We expect super trotters out of this combination with a non agressive natur. 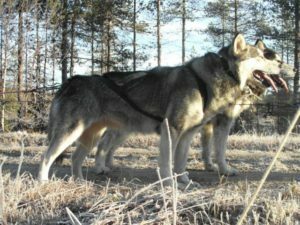 Puppys are well sized at birth, we expect them to grow to medium sized malamutes. 1 male stays at our kennel. 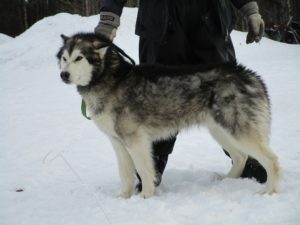 All others found a home at other Alaskan Malamute kennels and/or mushers and other active homes around Europe. Health results, working results and eventually show results will follow as soon as they appear. BtW Gold Rush Kenai: Show results: Puppy class, best malamute puppy of 4 puppys. and best puppy of show of 20 dogs. Junior class: ‘good’.